The day has arrived, folks! Mark of Orion is finally available for your reading pleasure. It has been two years since my last book release, but it seems like just yesterday we were doing all this for Xsardis. My New York Sister Julie spent the morning running errands with me. We got coffee, caught up, printed tickets, bought more than a dozen lemons (to the odd looks of the guy at Sam’s Club), previewed the ballroom, and came home. Then I was passed over to my mother for food, beauty treatments, and more plotting. Eventually I got some down time to practice my speech, organize my thoughts, and blog. Maybe it is the nature of a good day that puts me in a freer mood. 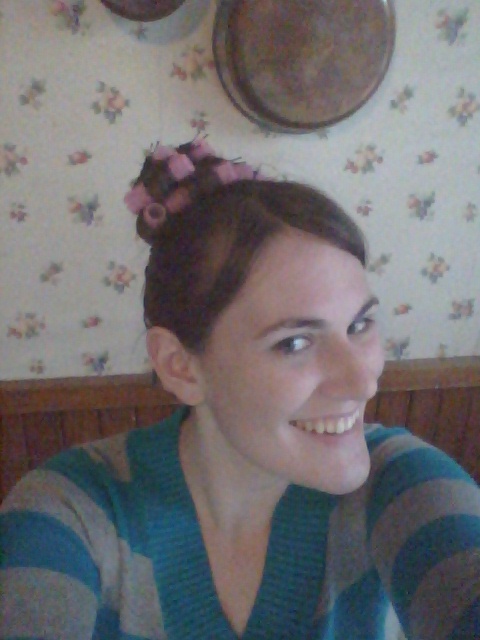 Otherwise, I am not sure I ever would have posted a selfie (I think this is my first)–let alone a selfie of me in curlers! “Hello, inner-child. I missed you in all the craziness,” I think. So, friends I know and friends I don’t, may you enjoy this November 15. Here in the frozen north, it is a wonderful occasion for gathering, slipping into unusual masks, and dancing our hearts out to the beat of Waltz music. Wherever you are, enjoy your inner-child and you’ll be celebrating with us in spirit. Countdown to Mark of Orion: 0 days.